One of the vans, as photographed by Claycord. The minivans sport an X-shaped frame mounted to their luggage racks, with dark recesses that likely house cameras at each corner. 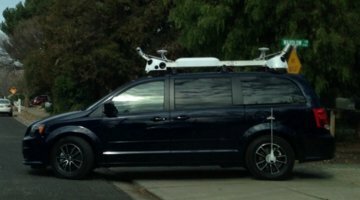 The California Department of Motor Vehicles confirmed to San Francisco CBS affiliate KPIX that a blue Dodge Caravan spotted with the equipment was leased to Apple. Along with the cameras, a pair of spinning cylindrical devices fitted to the front and rear look to be LiDAR sensors. LiDAR is a laser-based technology used to make high-resolution maps, and also forms an integral part of the sensing systems on self-driving vehicles, including those developed by Google. Analyst Rob Enderle told KPIX that he believes the vehicles are in fact self-driving cars, but that is an unlikely possibility given that Apple has not been issued a testing permit for those purposes. 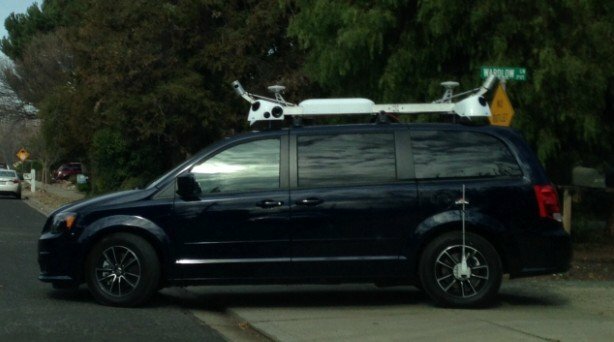 It is more likely that Apple is preparing to begin a mapping program similar to Google's Street View data collection initiative. Two small disc-shaped antennas are also fitted to the roof, as well as a sensor hanging over the rear wheel that could be used to more accurately measure movement as indicated by the rotation of the wheel. An almost identical white van with California license plates was spotted last September in Brooklyn. Enderle noted that the number of cameras on the minivan— there appears to be at least 12— seems to be a high number for a mapping vehicle, but Google's latest-generation Street View cars use a ring of 15 5-megapixel CMOS sensors. 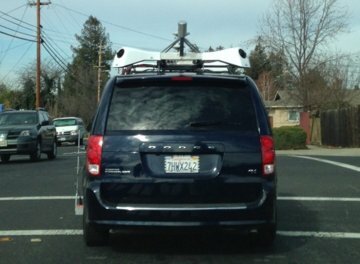 Aside from the physical configuration, the equipment on the Apple-registered van appears to be broadly similar to the technology fitted to a Street View car. Apple is known to have ambitious plans for its mapping service, and collecting street-level data is one of the only ways to ensure quality. Google's Street View program is widely cited by industry experts as a primary driver of Google Maps's accuracy. Thanks to AppleInsider reader Jason for the tip.